If you're looking for Census block maps, you've got 3 options: 1. online Cubit tool, 2. Census Bureau flat image files, and/or 3. Census Bureau TIGER files. The following text will give you some positives and negatives of each of the 3 options. If you look for census block maps on the Census Bureau's website, what you will find is a map of all of the census blocks in a given area. However, what the Bureau provides are flat images that can really only be used for reference, not analysis. Starting from the main Census page, you can find them by clicking on the links for 'maps,' 'map products,' 'census block maps' and then search through your state's folder for the right map. You'll need to know which specific sub-area you are looking for. Once you've located your area of interest, you'll then have to enter the Census blocks geographic identification code or FIPS number into the Census American Fact Finder tool to get demographic data for that block. While the positive of this process is that all of the Census tools are completely free, the negative is that it can take HOURS of work to go through the process to get the data you need. Another way to get block maps is build your own maps. You'll need to download the shape or boundary files (officially called 'TIGER' files) used in mapping with a geographic information system or GIS. You can download the TIGER files from the Census. These files contain only the boundary file for the area you are looking for. You'll need to load these files into a GIS software. Most people use ESRI's ARCGIS which is really pricy (think $1000+). You could also use MapWindow--a free GIS software--but it'll take some time for you to learn the system and how to re-project shapefiles if you don't already know how. Plus if you need demographic data for the blocks, you'll have to enter the geographic entity codes into the Census' American FactFinder, just like with the flat images above. While incredibly powerful and useful, the TIGER files are only useful if you already have mapping software and know how handle shapefiles. 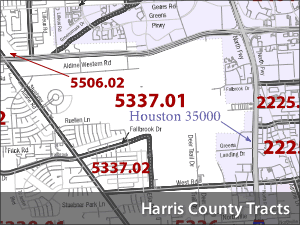 If you need to get Census block maps and data for a project quickly, check out the online Cubit tool. Using Cubit, you can draw your project area on an interactive interface. With the click of a button, you'll get Census block maps and demographic data in seconds. 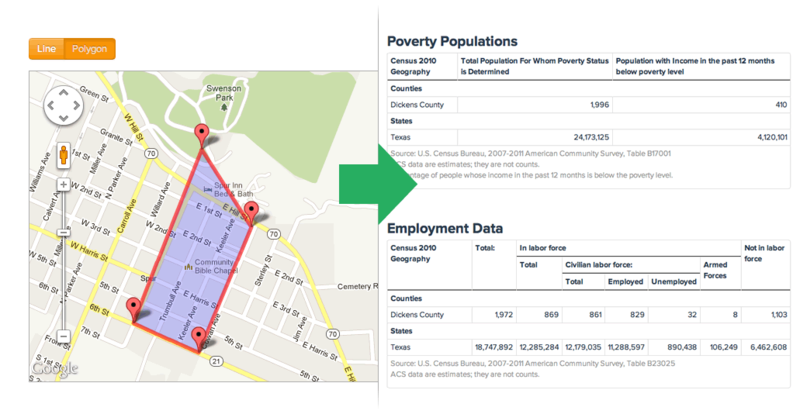 Learn more about the Cubit tool for getting Census block maps.